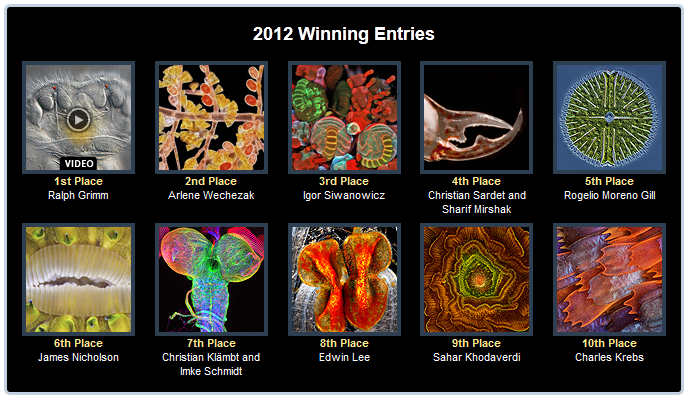 I’ve posted before about the Nikon Small World’s microscopy/photography competition. Today, however, focuses on another Maker of Excellent Photographic Equipment – Olympus. For the last 10 years (says the website), Olympus has been sponsoring an international microscopy (i.e.photographing things with a microscope) competition – The Olympus BioScapes Digital Imaging Competition – and this year’s winners have just been announced.Over 2,000 images were submitted this year, so the achievement is certainly an impressive one! When Grimm got the slimeball under his microscope and cranked the magnification to 200x, he couldn’t believe his eyes. “I had never seen this species of rotifer before,” he said. Rotifers are tiny animals that live primarily in fresh water and gobble up gunk. I found it difficult choosing my faovurite photos or videos (for there’s more than one video, huzzah!). Which is your favourite? Nikon’s Small World photo competition winners 2012 now out!